I know you have been patiently waiting for these new cameo frames and punch sets and they have finally arrived!!! I also couldn't wait to get my hands on them and make a sample. I kept the design of the card simple because I wanted the Cameo to be the focal point. Here, you can see that the frame of the cameo comes from a die. Next you punch out the oval and place it in the embosser to get the pretty raised image of the lady. I used pink Bazzill paper (the smooth side) and embossed the image. 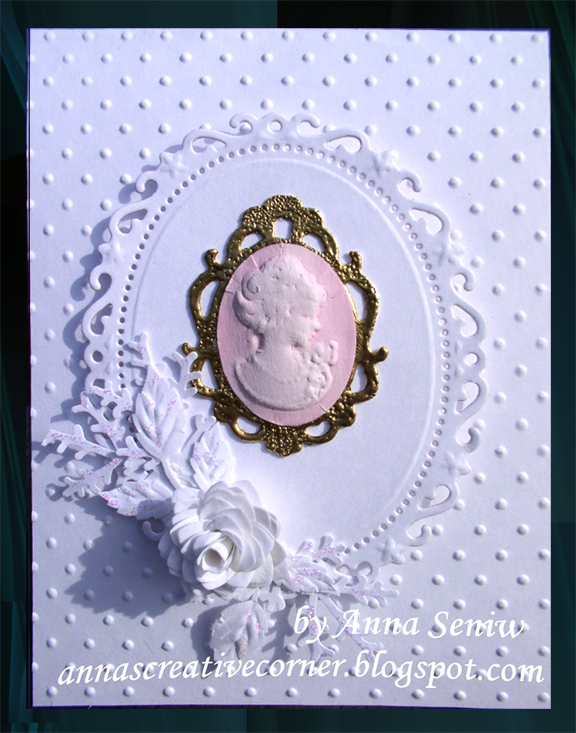 I then used Colorbox cat's eye Frost white ink directly to the paper to get the cameo lady creamy white. These cameos come in 3 sizes; small, medium and large. I used the large one on my card, again because I wanted it to be the focal point. These just arrived from Europe and since they are so unique, I am sure that they will be a hit. Let me know if you would like one of these sets and I can set it aside for you! very nice! it was great to finally meet you and see your store! It was so nice meeting you too, Elizabeth! Can't wait to see what you'll create with the dies you bought!